Sal is a native of Chicago, IL and has called Montana home since 2002. He began his medical journey and caring for patients while working at Big Sky Neuroscience and Spine Institute in Butte, MT and later Shodair Children's Hospital. He graduated from Carroll College in Helena, MT in 2009, earning a Bachelor of Arts in Classical Studies with minor degrees in Biology and Chemistry. He completed his medical training at Oregon Health and Science University (OHSU) in Portland, Oregon with a Masters in Physician Assistant Studies in 2014. 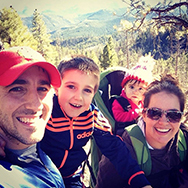 Sal's free time is enjoyed with his wife, son, and daughter engaging in outdoor activities throughout the various seasons including fishing, hiking, running, playing soccer, and snowboarding. He works alongside Dr. Hanson in both the clinical and surgical settings and is excited to be a part of the Helena Orthopaedic Clinic team.